In addition to maintaining our current restoration projects and planning new ones for the years ahead, CIR adopted a more active stewardship role for the San Marcos Foothills Preserve. In 2015, we now provide educational programs and have produced materials that educate visitors about protecting wildlife while we all enjoy the 210-acre Preserve, located between Santa Barbara and Goleta. This year CIR organized three educational walks at the Preserve, including two bird watching events with biologist Mark Holmgren and a plant walk with Ken Owen. All of these events were popular and were attended by nearly 60 people. CIR also created a web guide to the Preserve that highlights the plant and animal life, geology and history and more. We continue to develop a docent program for the Preserve, which will train volunteers to lead educational walks. watching walk at the Preserve. As CIR takes on new responsibilities at the Preserve, we’re mindful of our previous successes there. Since 2010, CIR has partnered with several non-profit organizations, businesses and County government to restore portions of the Preserve. Our restoration sites along Cieneguitas and Atascadero Creeks have been spectacular successes. Even during this dry year, in the middle of the worst drought in history, many of our plants continue to bloom well into autumn. The sites attract butterflies that feed on nectar from the flowers, and they attract birds that collect seeds and insects from the plants. In a generally dry and brown landscape, our restoration sites are some of the only green spots in the Foothills. The success of the restoration sites is due to our dedicated staff and the help of more than 1,000 people who have volunteered with CIR at the San Marcos Foothills since we began our work. Thanks to a grant from outdoor retailer REI this year, CIR also removed invasive plants along trails and at a freshwater spring, where several species of wetland plants grow. The REI grant paid for the cost of a staff person to lead the 16 volunteer days and for the cost of recruiting the 278 volunteers who participated. Thanks to REI and to the Volunteers! San Marcos Foothills Preserve Keeping CIR Busy! Since 2010, in partnership with the San Marcos Foothills Coalition and the County of Santa Barbara, CIR has been proud to work on several restoration projects at the 200-acre San Marcos Foothills Preserve in Santa Barbara, one of the most ecologically significant open public spaces in the county. The Preserve is located in the foothills between Santa Barbara and Goleta, and is a County open space. Funding in recent years for these projects was provided by REI and the San Marcos Foothills Coalition. These projects were designed to improve the native plant communities that provide resources to the native animal species, as well as enhance the public experience along trails. Volunteers at the Spring near the Antone Road entrance. In the last six months at the Preserve, CIR has held 12 volunteer events and over 250 volunteers have donated their time and energy on this public trail enhancement project. CIR staff, board members, and volunteers have removed several invasive plant species at the Spring, a natural fresh water source, and at restoration sites along Atascadero and Cieneguitas Creeks. Over 50 native Purple Needlegrass plants have also been planted by CIR and volunteers by the Preserve trailhead at Via Gaitero Road. 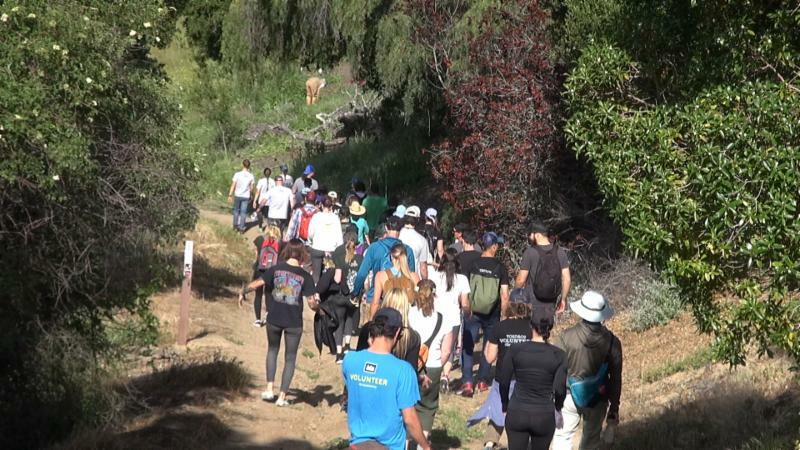 Four UC Santa Barbara organizations: Alpha Phi Omega Psi Chapter, Wildlife Society, Naked Voices, and the Hermanas Unidas brought groups of energetic and diligent students to battle these non-native plants. Groups from Stanford Alumni, the SB Rotaract Club, San Marcos High School AAPLE Program, and SB School of Squash have also joined in restoring this beautiful Preserve. REI provided free REI Stewardship 2015 t-shirts and REI store coupons to volunteers who participated in these habitat restoration events. In the near future, we will be spreading mulch in preparation for winter rains. Lupinus succulentus (Arroyo lupine) at the Preserve. CIR has also held 3 educational tours since January. Biologist Mark Holmgren led two bird walks in January and February of 2015, and gave participants an opportunity to view resident and migratory birds and other wildlife, and how they use the land we are working to preserve. CIR’s Executive Director Ken Owen led a plant walk in March of 2015, and participants experienced the many plant species of California native wildflowers in bloom. Wayne Ferren, CIR’s Principal Ecologist, also led a walk for the California Naturalist program in November of 2014. These fun educational tours were offered free as a part of a developing docent program, and CIR hopes to offer more educational walks in the future! Volunteers pose at the Via Gaitero Road entrance. More than 150 people from six local companies volunteered for Channel Islands Restoration on a single day in April at the San Marcos Foothills Preserve. Taking part in an annual corporate volunteer day, employees from Deckers, Patagonia, REI, Horny Toad, Vapur and Channel Islands Outfitters planted natives and pulled weeds at the Preserve located between Santa Barbara and Goleta. CIR is promoting partnerships with local companies, particularly those with an outdoor focus, to raise money for restoration projects and to recruit volunteers. Employees from many of these same companies, plus Amgen and Citrix Online, have also volunteered for CIR on many island trips. All of these companies encourage their employees to volunteer, and some even pay their employee’s wages while volunteering. In addition to volunteer help, Patagonia, REI (Santa Barbara store and the new Oxnard store) and Citrix Online have all contributed grant funding to CIR. This funding will support a new project in the San Marcos Foothills, help pay for school field trips to the Channel Islands and more. With public sector budgets continuing to tighten, CIR seeks to diversify our funding base, and we are very grateful for the support of our corporate partners. CIR will start a third restoration project in December at the San Marcos Foothills Preserve, an open space located between Santa Barbara and Goleta. Funding for the project will be provided by the REI Santa Barbara store, the Ventura Patagonia store and the San Marcos Foothills Coalition. We will focus on removing invasive plants along in the most sensitive habitats, and we will plant several species of natives at the main entrance to the Preserve. This project will rely heavily on the support of volunteers! The San Marcos Foothills is one of the most ecologically valuable sites on the South Coast, with hundreds of acres of grasslands, oak woodlands, and permanently flowing creeks. There are nearly 50 mammals found and the Preserve and 126 bird species. The Preserve has miles of hiking trails that provide spectacular 360 degree views of Santa Barbara, Goleta, and the Santa Barbara Channel. For the last three years CIR has been working with project partners and volunteers to restore habitat along Atascadero and Cieneguitas on the Preserve. We will be doing some additional planting at those sites as well, so there is ample opportunity for the public to get involved in these highly successful restoration projects.